Mercedes-Benz claims it is the inventor of the performance SUV. 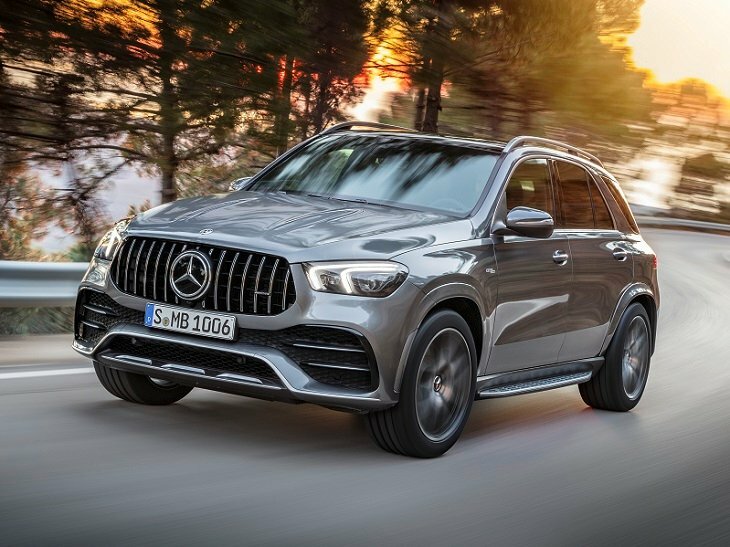 The first AMG-tuned M-Class arrived for the 2000 model year, and now, 20 years later, the 2020 Mercedes-AMG GLE 53 arrives based on the redesigned GLE-Class midsize SUV. In addition to special exterior and interior changes, the latest addition to the AMG lineup features an electrified drivetrain and a full mechanical massage touching every aspect of the vehicle’s driving dynamics. You can identify the new Mercedes-AMG GLE 53 by its unique grille, which has 15 vertical chrome strips and a double-ringed star emblem. Additionally, this model’s bumpers are restyled, the wheel arches are painted the same color as the body, and specific 20-inch aluminum wheels. A Night Package is optional, and it blacks out the SUV’s bright trim elements. Like the exterior, the 2020 Mercedes-AMG GLE 53’s interior is modified to convey performance. Aluminum trim, Artico (leatherette) trim on the dashboard, and a black headliner are unique to this model, along with an AMG Performance steering wheel with aluminum shift paddles and touch-control buttons. AMG-specific seats feature improved bolsters and are wrapped in Artico (leatherette) with Dinamica inserts (simulated suede). Red contrast stitching and red seat belts go with the cabin’s red interior accents. Leather is an option, as well as carbon AMG trim. Another option is a folding third-row seat, which brings passenger count to seven people. The available AirBalance cabin fragrance system offers an exclusive scent called AMG#63. The Mercedes-AMG GLE 53 is equipped with a light-electrified and turbocharged 3.0-liter inline 6-cylinder engine. The engine makes 429 horsepower and 384 lb.-ft. of torque, while the EQ Boost integrated starter generator and electric motor supplies an extra 21 hp and 184 lb.-ft. of torque. In addition to improving performance, EQ Boost also recovers energy to recharge the 48-volt electrical system, imperceptibly restarts the engine after it shuts down at an intersection, and facilitates a fuel-saving “gliding mode.” In total, the goals of the powertrain are to improve dynamic performance while reducing fuel consumption and emissions. A 9-speed AMG Speedshift automatic transmission funnels the power to the standard performance 4Matic all-wheel-drive system, which features fully variable torque distribution. As for acceleration, Mercedes-AMG quotes a 5.2-second run to 60 mph. A standard AMG Dynamic Select system provides Slippery, Comfort, Sport, Sport +, Individual, Trail, and Sand driving programs. These control the engine, transmission, throttle response, steering, suspension, and exhaust sound. Mercedes integrates AMG Dynamics into these driving programs, with Basic, Advanced, and Pro settings governing the AWD and stability control systems. When the SUV is in the Trail or Sand driving programs, Traction and Slide expand the AMG Dynamics settings. The GLE 53 employs an AMG Active Ride Control air suspension with adaptive damping and active roll stabilization. When off-roading, the suspension can be raised 55 mm for improved ground clearance. Additionally, the SUV includes variable-ratio speed-sensitive power steering, a performance braking system, and a performance exhaust system with adjustable flaps so that the GLE 53 emits a little noise or a lot of noise, depending on the driving mode. Mercedes is in the process of rolling out its redesigned MBUX (Mercedes-Benz User Experience) instrumentation and infotainment system, and the GLE-Class is one of the latest recipients of the technology. In the new GLE 53, MBUX includes a special AMG start-up screen and offers two unique display styles called Supersport and Discreet. Also, when the SUV is in the Trail or Sand driving modes, data related to slope, incline and level can be displayed on the instrument cluster. Because this is a performance model, new AMG Track Pace technology is also available for the GLE 53. Designed for use on closed courses, it measures and records up to 80 different vehicle-specific data metrics for later analysis. This technology also displays specifically selected values on the instrument cluster or in the optional head-up display.